If you’re here, reading this, that might mean you’re beginning to look at your body, and your (exhausting) efforts to try and change your body (or lose weight) differently. Or, maybe (just maybe) you’re on the precipice of deciding to (finally) give dieting up, and you feel like a failure because of it. If this is where you are, I want you to know, first and foremost, that I hear you. I see you. I haven’t shared your exact experience. But, I get it. I also get that in our culture, we equate thinness with health. Which is why I put “become healthier” in quotes above. Because quite frankly, the size of your body, doesn’t determine the health of your body. This is usually shocking for most to hear because we’ve been conditioned, usually for years, by doctors, friends, family, media, and “wellness experts” to believe otherwise. In my own professional and personal experience, I’ve seen “unhealthy” behaviors, eating habits, and modes of thinking in smaller bodies and bigger bodies. Contrary to what we’ve been led to believe, thanks to diet (and wellness) culture, health doesn’t have a body size. Rather, health is determined by our behaviors, our thoughts, and how we take care of ourselves (or how we don’t take care of ourselves), as a whole person. This idea that we should all be a certain size to be healthy (or even worthy) leaves out the concept of body diversity. Body diversity exists. Just look around. Bodies come in all different shapes, sizes, colors, ages, stages, and phases of life, as they should. We’re not meant to each have the exact same body shape and size. Wouldn’t that be so strange, if we did? So, why are we trying to? Why are we trying to meet a largely unattainable body and beauty standard and more often than not, destroying our bodies and our mental wellbeing in the process? Now, this is a complex, huge question that won’t be fully addressed in this blog, but hopefully just asking some of these questions sparks some questioning inside of you. Because, when it comes down to it, our body shape and size is largely determined by our genetics. Not to mention, our body’s set point is too, meaning the weight range our body naturally likes to stay at. Sure, we may sway plus or minus some pounds in either direction from the set point our body likes to nestle into, but our set point is where our body naturally likes to be at when we’re, for the most part, eating in attunement with our body’s hunger and fullness signals, eating foods that we enjoy and that are satisfying, taking care of ourselves, and when we’re just living our lives. In other words, our body’s set point is our body’s natural happy peaceful weight when we’re taking care of our bodies and not restricting, or eating to cope with uncomfortable emotions. We don’t get to decide our body’s set point. To delve a bit deeper here, our body’s set point is what keeps our weight relatively stable, which is why our body does everything that it can do to keep us safe (and keep weight on) when we’re trying to diet, restrict, or eat very little. When we’re dieting or restricting, our body cries, I’m hungry! I need food to survive. I must hold onto every bit of food I get. Who knows when more is coming?! This, essentially, is one of the reasons chronic dieters find it harder and harder to try and control their body’s weight with each new diet. And, one of the reasons when we chronically diet that we end up – usually – gaining weight when all is said and done. Our body is trying to conserve all of our energy and all of our weight, so if food is no longer available (which is what we’re setting our bodies up to believe), we have a better chance of surviving. With dieting and restriction or overexercising, we’re setting our bodies up to be very efficient. Efficiency is generally a good thing in our lives, but not in this case because it means our metabolism is going to slow and again, hold onto every single calorie of nourishment that we’re giving ourselves because we’ve set our body up to be in a state of deprivation. A question here that I often get is, How do I know what my body’s set point is? You don’t. I don’t. No one knows really. And if anyone tells you they know, go the other way. There is no way to test this out or to tell you. But you can begin to think up about – As an adult, in my adult body (this piece is important! ), what’s the longest amount of time that I’ve truly taken care of my body? Where I wasn’t exercising to punish myself or “burn” something off, or eating the smallest amount possible or using food, continually, to “numb out” or control? What’s the longest time I’ve had a normal relationship with food? And what happened then? For many individuals I’ve worked with over the years, they can’t remember a time in their adult lives where this was the case, where they were truly taking care of their body and not on some sort of diet or using food in unhealthy ways. In other words, where they were truly allowing themselves unconditional permission to eat and honor their hunger. If this is the case for you too, that’s OK. We live in a diet culture world, where we’re told there is one standard of an acceptable body. And, it’s a small, unrealistic sized body for a mature, adult human female (or male or however you identify). But do know that with consistent care and kindness and continual nourishment for yourself and your body, you will get to know your body and where it’s comfortable at. This generally takes about a year free of dieting or restriction to find out. Now, set point isn’t any new goal to reach. It’s not something I recommend weighing yourself to watch. I (generally) never recommend weighing yourself. It’s just the natural place, plus or minus some pounds that your body will hang out in. And yes, it can change some, as we go through different life transitions, such as menopause, aging, pregnancy, or as a result of chronic dieting or restriction (it usually goes up). But it’s still there. For some, this idea of a set point is scary. Usually, because of the unknown. But it’s not that unknown. Once you break free from diet culture and can really begin honoring your hunger and fullness and taking care of yourself as a whole person, your weight will either do one of three things – go up, down, or stay the same. Instead, there are many questions that you’re going to have to answer and think about on your own. Where does the idea of your “ideal body” come from? Who decided that that body – your “ideal body” – is in fact, the ideal body? With the framework and knowledge that body shape and size is largely genetically determined, what if your ideal body isn’t genetically possible for you? What do you need to healthfully cope? To find some hope? To take care of your WHOLE self? What if you could feel better in your body without changing your body? Is all the dieting, “controlling,” restriction, and unenjoyable exercise worth it for you to get to your “ideal body”? Is it actually working – mentally, physically, emotionally, and spiritually? Is it sustainable… for life? What if you just focused on caring for your body without trying to shrink your body? What have your dieting experiences shown you? If you’re restricting, counting, obsessing about, or “exercising off” your food in hopes of your body looking how you want it to look – is that really your ideal body? That sounds like an “exhausting body” to me! More importantly, if you’re putting all of your worth on how your body looks, what happens when your body changes with age, or you enter a new stage or phase of life (like pregnancy or old age)? What would it look like if you accepted and cared for your body? These are the BIG questions. These are the things to allow yourself all the time to think about and talk about and get support when you need it – from a dietitian and/or a therapist trained in body image and eating disorder work. Because the ironic thing about all of this is that in order to get to our “ideal body,” as a culture, we’re told to restrict, diet, and practice disordered thinking (and eating!) to shrink ourselves. And the only thing this does is has our body striving to hold onto everything we feed it. Striving to survive. Striving to keep us alive. Because we each were put on this planet for a reason, and I can guarantee you it wasn’t to diet and exercise ourselves into unhappiness, frustration, and confusion. Often, in this work with clients, when we dig deep, they’ll fantasize about a time where they were in a smaller body. And with some digging, we uncover that this was at a time when they were much younger and yes, bodies do change as we age, this is normal. Or, at a time where they were using disordered eating and/or disordered exercise behaviors to achieve this, and they were actually pretty miserable. But that part – the being miserable part – is often forgotten. And that’s the important part. That’s the real part. Not the fantasy part that diet culture has us set up believing. Diet culture has us believing that if we looked a certain way, we’d be happier. That if we were smaller, we’d be more confident. That if we were smaller, we’d be happier, have a better job, better home, more love, and the list goes on and on and on and on. Now, I’m not saying that weight stigma doesn’t exist. It does. But what I am saying is that we each have our own unique genetic blue print for our body shape and size. And, that dieting or restricting our food intake to manipulate this pre-determined genetic size does nothing but make us unhealthier. In fact, ironically enough, the number one predictor of weight gain is dieting. Some other causes of dieting and food restriction are: increased binge eating, decreased metabolic rate, increased preoccupation with food, a decreased sense of willpower, increased feelings of deprivation, and an increased sense of failure. I think we can all say that none of these things sound too healthy. In my experience, living in hopes of achieving your “ideal body” is as if you were given a lemon tree, but you wanted an apple tree. And, you’re trying to get your lemon tree to become an apple tree. But, no matter how much you water, cut, or replant your lemon tree, it’s not going to become an apple tree. So instead of spending all of your time trying to get your tree to become something it’s not, why not get to know your lemon tree, so you can learn how to care for it, instead of trying to constantly change it? Because when you begin caring for your lemon tree, I’m pretty sure that you’re going to begin enjoying your tree more and more, and in turn, want to take care of it. This leaves you with some thinking. The thinking of some big questions. Do you want to spend your entire life at war with your body, trying to achieve a body that may not genetically be in the cards for you? Or, do you want to spend your time working on self-acceptance, body respect, and living a bigger, more fuller life? Both take work. Both can feel exhausting. But one, leads to light at the end of the tunnel. The further I’ve gotten in my career, the less I share personally. But, I will share that years back when I let go of trying to achieve “my ideal body,” I finally was able to begin healing my relationship with food and in turn, my body image. I realized that there was no way I could go on spending the rest of my years like I was. It just wasn’t worth it. In my experience, I did gain weight. (I know I still live in a privileged body). But, my body needed to gain this weight. My brain needed the nourishment. And my mind needed to relax and let go of the constant thoughts about food. In my experience, trying to achieve my ideal body, which was never possible, was one of the unhealthiest, worst periods of my life. And, I can tell you that no “body look” is worth the peace of mind, freedom with food, or compassion that I have for my body and self today. You can find this too. 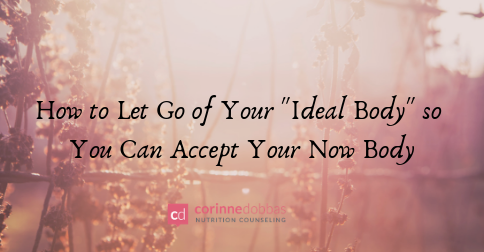 It starts with deciding that letting go of your “ideal body” is more important to you than trying to achieve your ideal body. It starts with choosing mental, emotional, physical, and spiritual wellbeing over trying to shrink your body or lose weight. It starts with allowing yourself to see that maybe there’s another way here. And, it continues with realizing that maybe you feel so poorly in your body because you’ve been treating your body without compassion because it’s not your ideal body. And, perhaps if you started respecting your body – just as it is now – you’d actually feel better in your body… without changing your body. And, it continues with realizing there’s more to life than trying to change your physical appearance or lose weight. And, it continues with grieving your “ideal body” and perhaps all the time you spent dieting and punishing yourself for not meeting this “perfect” body. And, it continues with being neutral about your body and allowing yourself to just get to know your body. What does hunger feel like? What does it feel like to be pleasurably full? What are your favorite foods? What does it feel like to eat foods you find truly satisfying? And to engage in movement you actually enjoy? What does it feel like – in your body – when you stop trying to control your body and instead, start working with your body and feeding your body? And, it continues everyday by choosing to respect your body. You don’t have to like your body, but you can respect your body. By feeding your body enough. Making sure she gets enough rest. Moving your body in ways you enjoy. And showing your body loads of compassion, as you build inner-confidence in your healing journey. Overtime, you’ll ease into your body. You will find a more relaxed approach with food. You’ll begin to think about how you’re so much more than a body, but thank god you have a body, so you can life your big, bold, messy, beautiful life. And then, all of a sudden, you may just stop and realize that you’re grateful for the body you have. Sure, you may like if your body was a little more toned, but you’re grateful for the body you were given. Because it’s your body. And, you want to be kind to it. Tribole, E. (2012). Warning: Dieting Increases Your Risk of Gaining MORE Weight (An Update). Retrieved from http://www.intuitiveeating.org/category/reject-diet-mentality/.